Every time Tamiya (or one of the other surviving R/C brands of the 1980s) remakes an old toy, the remake model comes with lots of alterations when compared to the original model – some large, many small. This is because 30 years or more have passed since the original kit was manufactured, and even though the remake is aimed at the nostalgia market, a lot has changed in the world in the last 30 years such that it is impossible to reproduce that original kit exactly the same way as it originally was. Obviously technology has changed a lot. But in addition, R/C companies are now more corporate and streamlined in their approach, than they were in the 1980s. There are also more legal restrictions on toys and brands today than there used to be. And lastly, but perhaps most significantly, where once upon a time all R/C models were lovingly crafted by staff right at the company headquarters (in places like Japan, the USA or Germany), today practically every single R/C car on the planet is manufactured by low-paid labour in either China or a similar location with the lowest-possible manufacturing costs. For all these reasons, today’s remakes of classic R/C kits carry a long list of alterations, tweaks and exclusions when compared to the originals. Some of these alterations are intentionally designed to fix technical issues with the original, that sometimes manifested themselves under extended running. Some are there to intentionally differentiate the remake from the original. But others are the result of legal constraints – e.g. aspects of branding, sponsorship and naming have changed. And the rest are there due to manufacturing constraints such as the use of entirely different molds and materials, often to save costs. The alterations commonly include (but are not limited to) things like: changed body shells made from a different mold, changed transmissions and driveshafts, a different chassis, different tyres, fake sponsor decals, different box art, different suspension, different speed control, different plastic and rubber compounds throughout the kit, a change in the country of manufacture (China or The Phillipines, instead of Japan), and even sometimes a different name for the model itself. Despite these many changes, every new remake is greeted with excitement from many people. Often because they view it as a new chance to own something they wanted in the 1980s, but believe is too hard to find otherwise. And I do understand the excitement – up to a point. It is fun to see the appearance of old things, in stores again, albeit in a different form. Even I have walked into hobby stores and thought “hey, it’s nice to see that old kit again”. Or at least a kit that looks like the old kit anyway, even if it isn’t the same kit. But often the celebration over a remake carries with it a belief that companies remaking kits is the only way to find or afford those models again. And that without them, the original models are too hard to find, too expensive, or only the preserve of serious collectors. Yet this is not really true. How hard is it to find original R/C kits and cars? Brands like Tamiya sold literally millions upon millions of R/C cars in the 1980s – far more original kits were sold during those popular years, than the corresponding remake kits which are on sale today. Many of those original cars are still out there. Yet none of the websites and magazines that celebrate whenever another classic kit undergoes a remake, seem to mention the fact that a remake kit is not exactly your only way to re-live a particular car. Now, don’t get me wrong. 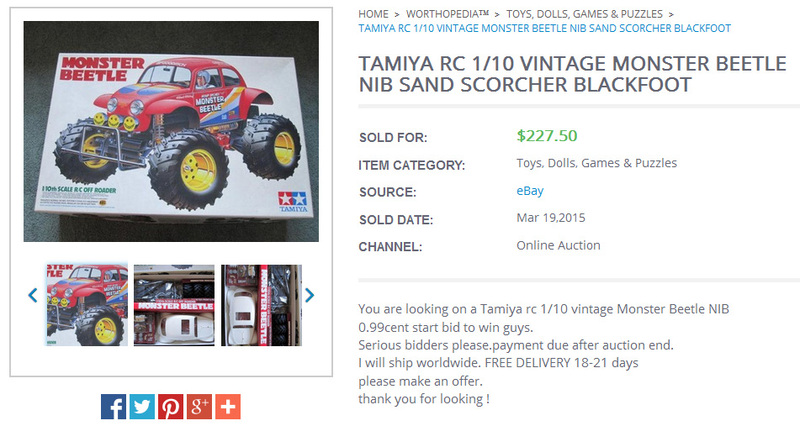 Remakes are generally cheaper than the more collectible and rare original examples of Tamiyas. And sure, originals can be very rare. It depends on what you want. New in box, unbuilt originals are the most rare by far. New built examples are a little more common perhaps, but still fairly rare. While used examples are actually quite numerous. Generally speaking, toys that were made 30+ years ago (even when they were made in large quantities) are always going to require a bit more effort to find in good condition today, than simply clicking “buy now” on something which is currently in production. Finding original toys from the 1980s requires a little time, a little patience and some research. But then, the harder it is to find or own something, the more rewarding it can be when you finally get your hands on it. So, part of the fun of looking for vintage things is the ‘treasure hunt’ itself. But the simple fact is: original cars are not impossible to find. Nor are they impossible to afford. A lot of the excitement over the remakes is (it has to be said) often spurred on by commercial hype and advertising, more than fulfilling some huge hole in the market. Remaking old products is an economical way for R/C companies to make money. And that is their primary reason for doing it. Let’s start with the vintage thing that is the hardest to find: a new in box, unbuilt vintage kit. If you’re really patient, you can still find original, unbuilt Tamiya kits from the 1980s, and occasionally you can even find them for a low price. This doesn’t happen every day. It might only happen once or twice a year per model. And most original kits are priced high, because there really are not that many left and there is a lot of collector demand for them. But sometimes prices are not so high, and sometimes things do slip through the cracks. You just need to keep an eye out for “low-hanging fruit”. Sometimes you can grab something that nobody else seems to have noticed, for a lot less than it normally goes for. Often this can be due to a seller listing something with poor photos, sparse detail, or only offering to ship it within a limited area. So let’s look at some examples in the context of the Tamiya Monster Beetle. The new Tamiya Monster Beetle remake will (according to Tamiyausa.com) retail for about US$274. And when you think about it, that’s no small amount of money in itself. In my opinion, if someone can afford to pay US$274 for a remake like that, they can also afford to look at some pretty nice condition, original examples of the Monster Beetle just as easily – provided they have the time to shop around. Yes, this is $110 more than the upcoming remake. Admittedly, you would have needed to save up a little more of your hard earned cash to win it. But remember that this was an original kit from 1986 – the authentic 1980s toy, still unbuilt. It had all the vintage parts, decals, artwork…a true collectible. If you love the Monster Beetle, it just doesn’t get better than that. There have also, in recent years, been about a dozen others on US eBay alone that have sold for between US$350 and $450. Of course, I could easily cherry-pick a long list of examples of the original Monster Beetle that have sold for US$600+ or US$800+ in recent years. And even body sets alone that have sold for US$500+. High prices are a lot more common, and the average price of any original collectible is also high. My point with this article is not to say “bargains are everywhere!”. They’re not. (That’s what makes them bargains). My point here is merely to say that a keen-eyed, patient observer can nonetheless, find an occasional bargain on an original item. And that when I see such bargains simply come and go – often in broad daylight on eBay – I have to wonder why a ~$300 remake generates so much buzz. It amazes me that people are often not paying attention to the vintage treasures that having been coming and going on eBay, for years. New-built original examples are of course, cheaper than unbuilt kits too. While used examples are cheaper still. And there is no shortage of used stuff at any given time. The used market is, and will always be, a buyer’s market – particularly for those who enjoy restoring things. If you really want to enjoy vintage R/C on a budget, then restoring used models to original specification, with either new or used original parts, may be your ticket. It’s a very satisfying hobby to get into, and you are giving ‘new life’ to old toys in the process. In addition, once a remake comes out, you will often find that original examples are a little further within the reach of your wallet than they were previously. Just for a little while anyway. I am sure this will happen to the Monster Beetle too, as it has happened to every other vintage Tamiya kit. But be warned: the value of original models always bounces back after a year or so once the market settles after a remake. Original examples of any classic/popular toy will always remain strong, and increase in value over time, with mint/unbuilt examples experiencing the sharpest demand (since they are basically like gold to collectors). I can think of several vintage Tamiya R/C kits whose prices are now going from strength to strength, just a couple of years after a remake edition came out. So by all means, buy the remake kits, build, run and enjoy them. They are plentiful and so are the spare parts. Just remember that they are new models in Tamiya’s history, and as such, contain many differences to the originals. And don’t assume that the originals are outside your budget. And if you’re nostalgic like me, then it doesn’t hurt to keep one last thing in mind too. And that is: you only live once. Life is short. If you’re a 1980s toy fan, you’re probably somewhere in your 30s or 40s by now. And who knows, perhaps you’ve now passed the halfway point in your life? It’s a depressing thought, but it’s probably true. If you’ve always wanted to own a particular toy, perhaps you deserve to own an original example of it? Only original 80s toys have all the quirks, charm and old-school tech of the 1980s, and in the case of R/C cars, they are also the only ones manufactured in their country of origin (e.g. Japan) rather than off-shored in China or the Philippines like everything today. If your budget is tight, then set-up some saved searches on eBay, contact some collectors and read some forums. In a few weeks or months, you might be the proud owner of the true, original model at a price you can feel happy about. And you’ll always know “it’s an original”. I would NEVER build a vintage NIB rc. I’d be happy to buy a rere, build it, and probably even lightly run it! (then shelve it probably haha). To me that’s the fun of reissues. Cheers Dave. There was a time when I might have agreed with you about not building a vintage NIB kit. But then one day, I realized something 🙂 When I was growing up, I had wanted those models so badly, but couldn’t really afford any of them. And now, if I picture myself old and dying someday, having lived out all my years without ever having had the chance to enjoy building those original kits, would I regret it? The answer for me, is yes. I really would regret it. And the reissued kits just don’t make up for it, as they’re just not the same to me – they are really just tribute models that contain a lot of differences. But not only that, they also lack the provenance of having actually been around in the 1980s. They’re ok to build and run, but they’ll never be a substitute (to me) for building and either displaying or running an original. On the one hand, I do love collecting NIB vintage kits and keeping them NIB. On the other, I know I want to experience building them all someday. (Sidenote – this is what has led me, in most cases, to try to collect multiple examples – one to build, another to preserve!). But then of course, on the other hand, given their significance in toy history, I also lean toward the act of preserving a lot of original NIB kits so that examples of them continue to exist once my time is over. Who knows, they may end up in a museum one day – and that is going to enjoyable for people to see as well. Much as it’s amazing today to see toys in museums that are over 100 years old (or as is the case in the Museum I once visited in Cairo, toys that are now thousands of years old). What’s very interesting about this comment is indeed that the value of these nib kits will eventually decline. Once we are all dropping off the collectors curve, there will be no younger generation looking to buy these nib kits. This means prices will come off in the end… It’s only a matter of time. So if one is to keep a kit nib, it better not be for the investment value. This is the key reason that most of my collection is built kits rather than nib. I think there will always be inherent value in vintage toys that were made with a degree of quality and/or an interesting engineering philosophy that reflects the time they were made. We don’t see vintage meccano, model trains, planes or teddy bears dropping to low values – quite the opposite, even though they date back to the early 1900s and many of those who owned the earliest ones as children have now passed away. I don’t think vintage R/C cars will be any different. I also suspect that in the very long term there will always be R/C and motoring enthusiasts around who appreciate the history of the R/C hobby, regardless of whether they are old enough to have owned early models as kids. Much in the way that full-sized vintage cars will never decline in value either, despite there now being nobody left alive who owned the earliest ones in their heyday. For me, a rere Hornet for example captures the essence of the original, including the build and running. Something like the Holiday Buggy does not, as it’s a totally different modern chassis. To totally contradict myself, I run my old original Hornet, and the reissue is kept NIB!! G’day mate hope you are well . You know of me as TC Swarm. I’m a keen collector of early vintage R/C kits mainly Tamiya NIB but anything not nailed down, early/vintage/collectible/and nostalgic,and yes in my 40’s as as you mentioned “perhaps past the halfway point in life”. The Tamiya collecting bug for me has lost its shine to some extent due to all the re releases but I still go after those elusive kits that are on my hit list I just don’t do it now with so much vigor and enthusiasm as I once did . For me most of the fun in collecting is the hunt I love hunting for old classic kits /toys and closing a deal its my preferred drug of choice I get that high hunting for toys that remind me of my youth things I would often stare at for ages in store windows at and wish I had them . Your right old kits can still be obtained at good prices the key being “patience is a virtue” many people don’t have the sort of patience that is required to hunt down an old kit and many people would never build an old kit so I guess to some extent the re re addresses this issue . I look on forums and read that another great kit of yesteryear is about to be released and my eyes glaze over to some extent………but there is something good that comes out of a re issue and that is it lowers the price in many cases of the original kit and suddenly selling sites are flooded with the old kits which for me is a plus as the affordability factor then comes into play and the chance to add to my collection increases. For me at the end of the day its personal I guess ,its my hobby and I like collecting vintage kits and toys and really I did not start collecting for an investment I started collecting for “Me” ,really who cares if Tamiya re releases kits we know we have the original and one day our kits if your looking at them for a monetary point of view will become even more desirable . It must be remembered though we are in a minority and we see things differently form the majority ,but for me I would not have it any other way . Anyway mate your story was a good read and brought up some very valid points . (PS) Still looking everyday for an NIB Aeroflyte Platypus……. I live in hope !! Great comment Stuart, and yes I certainly do remember you. I think you have a very similar approach to collecting as I do. And if people appreciate and seek out original examples of kits, then as you say, the arrival of reissues often make those originals a tad more affordable, as the reissues draw away the casual fans. In the long run, the originals will always continue to be more valuable and sought after (on average) than any reissue. As I’ve mentioned elsewhere over the years, I also think that if many Tamiya fans are somewhat more “reissue-happy” than the average toy collector, then they are in fact the ones in the minority among the wider toy collecting community. Reissues are worth only a fraction of originals in virtually all other toy collecting fields (have a look at NIB Transformers reissues vs originals, one day) or collecting fields of any kind. So based on the not inconsiderable statistic of “it happens with pretty much every other collectible” – you’d have to suspect Tamiya kits will tend in the same direction in the longer term (ie. original examples will grow in value despite reissues). The whole concept of reissued R/C kits is actually still quite new too. Whereas in say, action figures, it has existed for far longer (decades) and probably just had more time to settle and be understood by everyone interested in collecting them. The rereleased kits have put right most of the problems with the original kits (,Monster Beetle drive shafts and Lunchbox/midnight Pumpkin Front gearbox spring as two examples !) that created some of the biggest problems for owners. I grew up owning most of the original Tamiya kits along with some Kyosho kits due to the fact my father owned a model shop. I will eventually order a new Monster Beetle as that was my favourite of all time! Wow, having one’s dad own a model shop back during those years would have been pretty special Stuart. I hope he asked you “Which kit would you like this year?” each Christmas? I’m sorry Stuart but I disagree…The reissue Monster Beetle body is rubbish. They didn’t even include the proper full window glass piece and the body is thinner and flimsy conpared to the original. I managed to pick up a non working monster beetle a few years ago for £10 and I’m on the process of rebuilding and upgrading it atm lol!